Solo play honors legendary performer, patriot and feminist Marlene Dietrich. 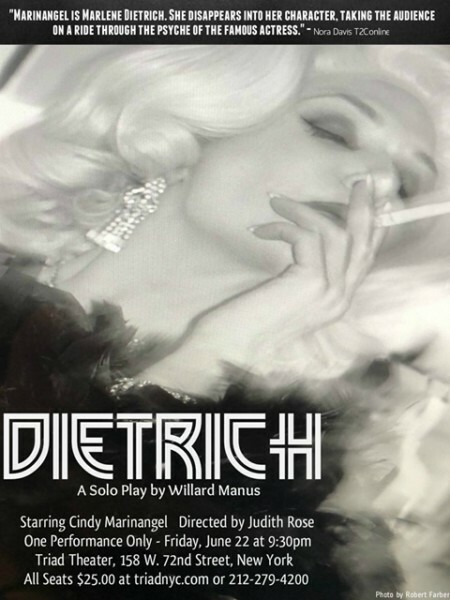 “Dietrich,” a compelling solo play about iconic German actress Marlene Dietrich, will wow New York audiences in a special one-night performance at the Triad Theater June 22. Written by Willard Manus, directed by Judith Rose and starring Cindy Marinangel, “Dietrich” is a based on a true story. Set in May 1960, the play takes place when the actress returned to the Berlin stage for the first time since fleeing the Hitler regime in the 1930’s. Inside her dressing room at the Tatiana Palast Theater, Dietrich weighs whether to go through with the live performance despite threats on her life by Nazi sympathizers who resented her for having spent much of World War II entertaining American soldiers on the front lines. To them, Dietrich is a turncoat; a traitor who deserves to be shot and killed on stage. 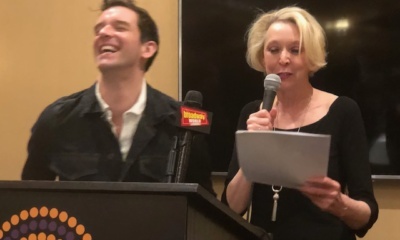 “Dietrich” (formerly known as “Marlene”) celebrated its world premiere at the Brickhouse Theatre in Los Angeles and recently debuted in New York at the Hudson Guild Theatre as part of the New York Theatre Festival’s annual Winterfest. Cindy Marinangel is a Lifetime Member of The Actors Studio and a graduate of the Chicago Second City Conservatory. Marinangel was recently seen in “Beverly Hills Christmas,” a holiday film starring actor Dean Cain that airs seasonally on UPtv.For more information, visit www.cindymarinangel.com. 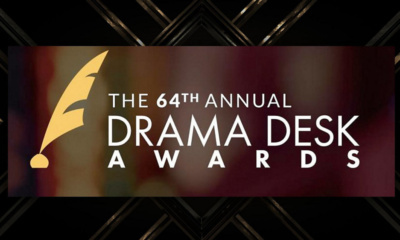 Judith Rose is a member of Actors Equity, the Society of Stage Directors and Choreographers as well as the playwrights/directors unit of The Actors Studio. 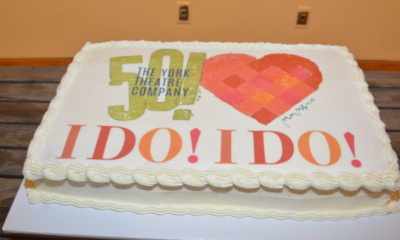 She directed Ed Asner and Estelle Harris in “When One is Gone,” and Betty Garrett and Tess Harper in “Wendy and Me.” In 2017, Rose directed Broadway veteran Maybin Hewes in “Still Struttin’” and “Don & Me,” both one-woman musical shows. “Dietrich” will take the stage at 9:30 p.m., at The Triad, the celebrated and widely-known Off-Broadway theater located at 158 W. 72ndSt. Tickets are $25. 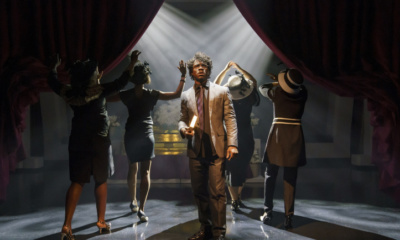 For tickets and more information, visit http://apps.vendini.com/u/73b311ea71 or call 212.279.4200.